• Under the "Posting" tab (where you usually type a regular blog post). There is a link to the right called "Edit Pages." It's that easy! 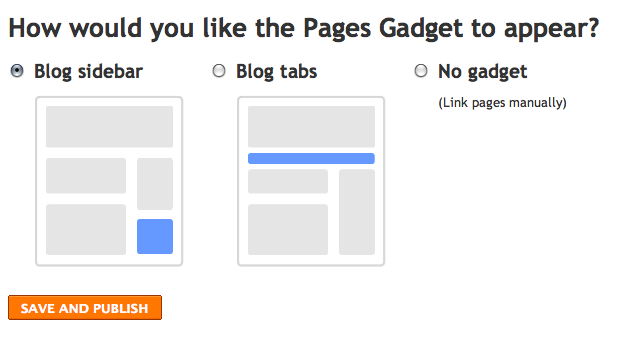 Do you use pages? If you try this feature and like it, let us know in a comment with a link to your blog so we can see how it worked out! Thank you Lynday! I want to redesign my page so this is JUST what I need. This has come just at the right time for me - I;ve actually been browsing blogs this morning for ideas and inspiration! I started using pages some months ago and love them - lots of possibilities for content! I do use pages to categorize, but I do my blog posts on the main page, if that makes sense. Thanks for the information. I think I will use it someday. hiya , thanks so much for the tutorial and yay it worked for me , cant tell you how long i have been trying to work this one out x now next question , i have made a page called my projects and would like to ask you if you could show us how to add projects from my blog to this page or is it only for new projects , hope this makes sense ? I came to this site specifically seeking a tutorial on pages and wala! it's the most recent post! Thank you for reading my mind :) I just made an About Me page and will be creating more throughout the week! I do use the pages, but when I want to write for a certain page somehow I end up messing it up, it doesn`t show on that page if that makes sense. I already use and love pages. It's nice that you're putting that info out there in case people didn't really know about them. They're so useful. I tried out the pages with the first Blog Club instructions. Works Great! I was able to add more to my "About Me" and I'm keeping a reading list. Thank you for sharing! http://kninerts.blogspot.com if you want to see how it looks on my page. I do love the Tab feature! I would love customized fancy pretty ones, but for now... these will do me just fine! I do have a couple of pages on my Blog, but I have a question for you. If I make a new post, it comes up on my home page and is emailed to my followers, but if I make a new post on one of my pages will my followers also get an email? I'd like to categorize my postings but I want everyone to be notified of a new post. Should I put it on both the home page and in an additional page? Hi all, I'm using the new blogger interface, and I wanted to creae some pages. I have no idea what I'm doing wrong, but I can't find it's link (after I created it), so that I can link to it from my main page. I want to manually link it. Can someone please direct me to a good "how to" on this. I can only find tutorials on the old blogger, or non specific on the new interface. Hi Judy! You didn't leave any contact info, so I hope you get this. I totally understand what you are saying about finding links. It is also difficult to find links if you like to back-date posts, which I do. In the old interface you could click View Post and you'd get the URL Link immediately. With the new Blogger you have to do a little more work - sadly. You should be able to find your link in the Pages section of your blog...if you are looking at the inside layout portion of your blog click on Pages...then locate the page you need the link to, click on View. This will bring the actual Page up and you can copy the URL. Hope this helps. You can also find your Permalink now on the right hand side of the posting space in your Layout. If you click on Permalink it will give you the post's URL address. You also now have the option to create a custom permalink!